Gorillas are increasingly in danger from wars like the conflict in the Democratic Repbulic of Congo and continuing deforestation. The UN Environment Programme is so concerned that the high-powered organisation has named 2009 "The Year of the Gorilla". 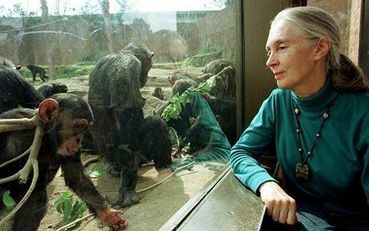 Happy Birthday to the great Jane Goodall, who is 79 today. "Goodall is a devoted vegetarian and advocates the diet for ethical, environmental, and health reasons."